Valentine’s day is this weekend and it is a special day for me. Not because it’s Valentine’s day, we don’t make a big deal out of it, but because it’s a year since I started this blog! My Linzertorte recipe was the first post I wrote. One of the things I love most about blogging is reading your comments on a post. Some of you actually baked the cake and loved it. It was so nice to hear! I love taking photographs in the kitchen. The light is great and I always have flowers on my kitchen table. So I probably spend more time in the kitchen taking pictures, than I spend cooking. Sorry to those who like recipes more than flowers, but you should do what you love to do and what you are good at. I do intend to bake the same cake again this weekend, if you like, you can still find the recipe here. For some people, Valentine’s day is all about red roses. The week before Valentine’s Day is one of the busiest weeks of the year for FloraHolland, the largest flower auction in the world. 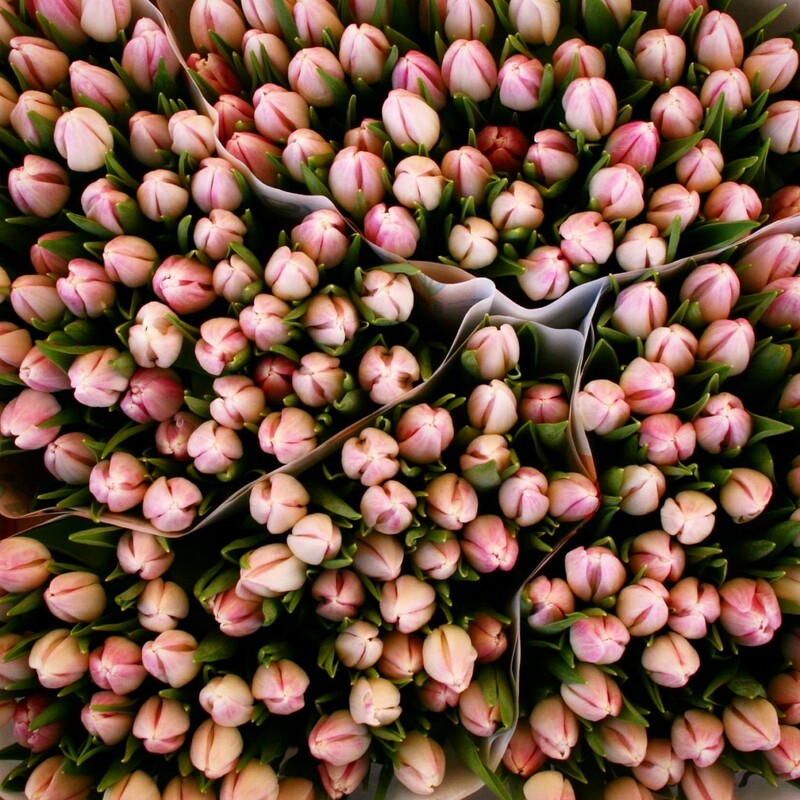 Roses and tulips are traded the most this week; about 100 million roses and 120 million tulips. Of these 100 million roses, about 75% are exported. France, Germany and the UK are important export countries. The Dutch and Germans are happy with a mixed bouquet. But apparently the French and British feel there is only one real Valentine’s Day flower: the rose. But did you know most roses are not grown in Holland? Dutch rose growers are having a hard time competing with roses grown in Africa, successful because of the sunny climate and cheap labour. African roses, most of them from Kenya, are imported and sold through the flower auction. If you live in the USA, no difference, just replace Africa by South-America, and Kenya by Ecuador. I am not worried about the Africans having a piece of the cut-flower industry, it provides income for people in developing countries, who can be against it? There are concerns, though, about the use of pesticides and poor labour conditions for the women workers. There is a growing awareness among the public about the importance of a sustainable cut flower production. Nowadays you can buy fair roses in supermarkets. Still, I am not very fond of supermarket roses. Often they wilt before they have completely opened and they have no scent. So here are a few alternatives to the traditional red rose. Winter flowers grown inside that are in season right now. Anemones are perennials that are a part of the Ranunculaceae family. There are many different species. We have the wood anemone growing in our garden, it has small white flowers and is a really charming groundcover. Most anemones flower in spring, except, of course, the autumn-flowering Japanese Anemone. I love Japanese anemones for the garden, like the ‘Pamina’ I saw in the Botanical garden. I think the only anemones grown as cut flowers are the poppy anemones. They have striking black centres and bright petals in red, white, blue, pink and purple. The stems are hollow and will rot easily, so don’t give them too much water. The name comes from the Greek anemos, meaning wind, and anemones meaning windflower or daughter of the wind. Isn’t that poetic? In Greek mythology, Aphrodite loves the beautiful mortal Adonis. Adonis is killed while hunting and Aphrodite turnes the blood drops that fall from his wounds onto the soil into a blood-red flower. Anemones symbolise both forsaken and anticipation. Ranunculus are one of my favourite flowers. I love their delicate layers of paper thin petals. I always find it amazing that so many petals can come out of such a small bud. They come in happy colours, including bright pink and orange, but also in soft whites and pinks. Ranunculus are also a part of the Ranunculaceae family. The ranunculus we know as a cut flower is the ranunculus asiaticus. They also have hollow stems so the water level in the vase needs to be low. The name Ranunculus is Latin for little frog. Possibly because they grew near water, or because they were as plentiful as little frogs in the spring? 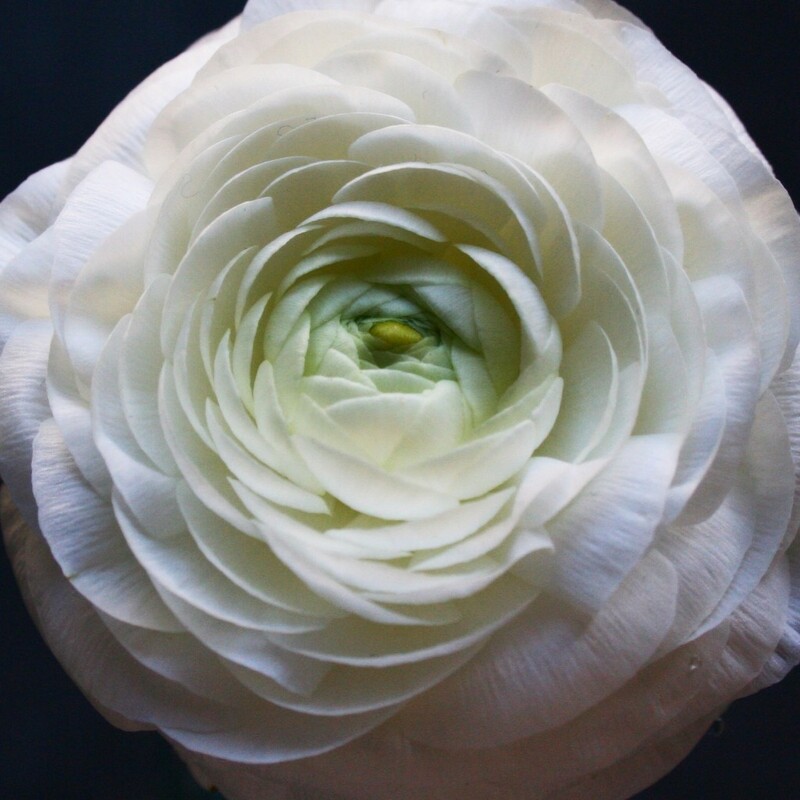 While many flowers have multiple meanings, the ranunculus flower does not. Ranunculus symbolises charm. Giving someone a bunch of ranunculi is like saying: You are radiant with charms, you are rich in attractions. Not bad! I think by now you know about my love for tulips. To me, they represent spring more than any other flower. They are fresh when you first buy them, continue to grow and twist in the vase and remain beautiful even when the are fading. 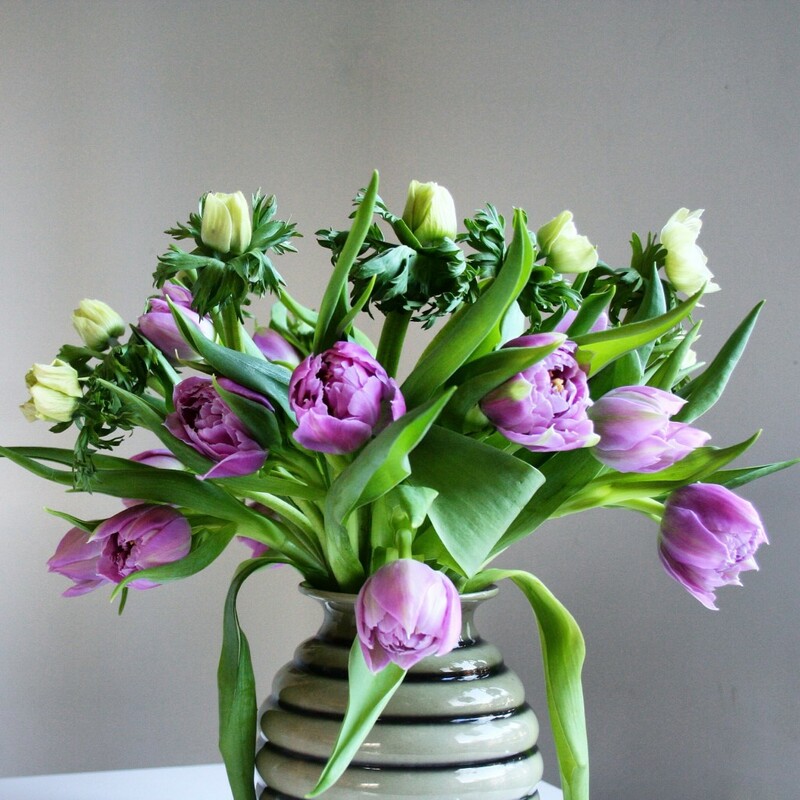 The tulip is a classic flower of love and another favourite flower for Valentine’s Day. 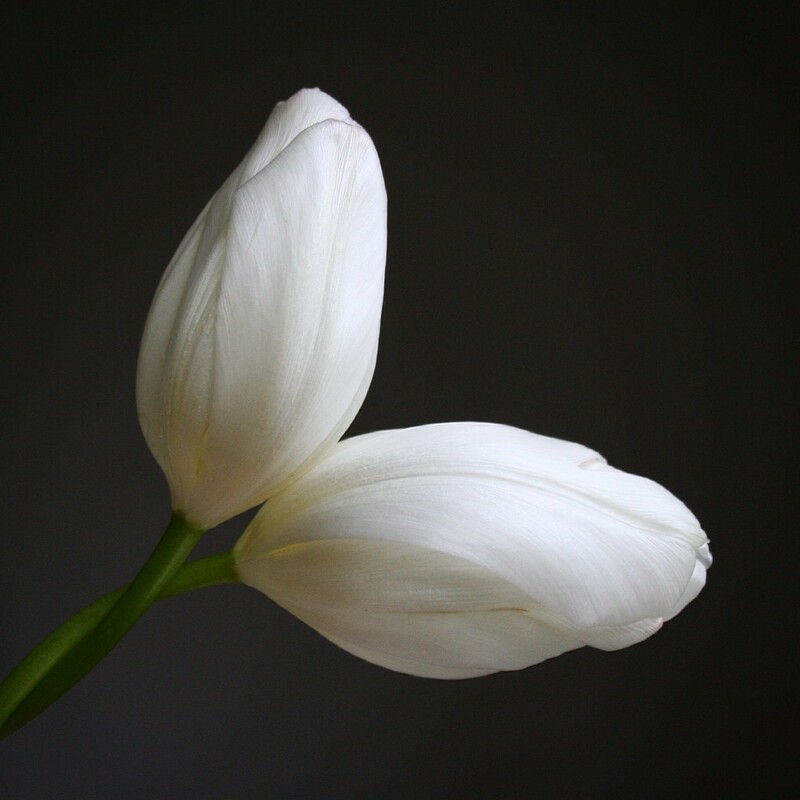 Tulip comes from the word turban. It was fashionable in the Ottoman Empire for sultans to wear tulips on turbans. 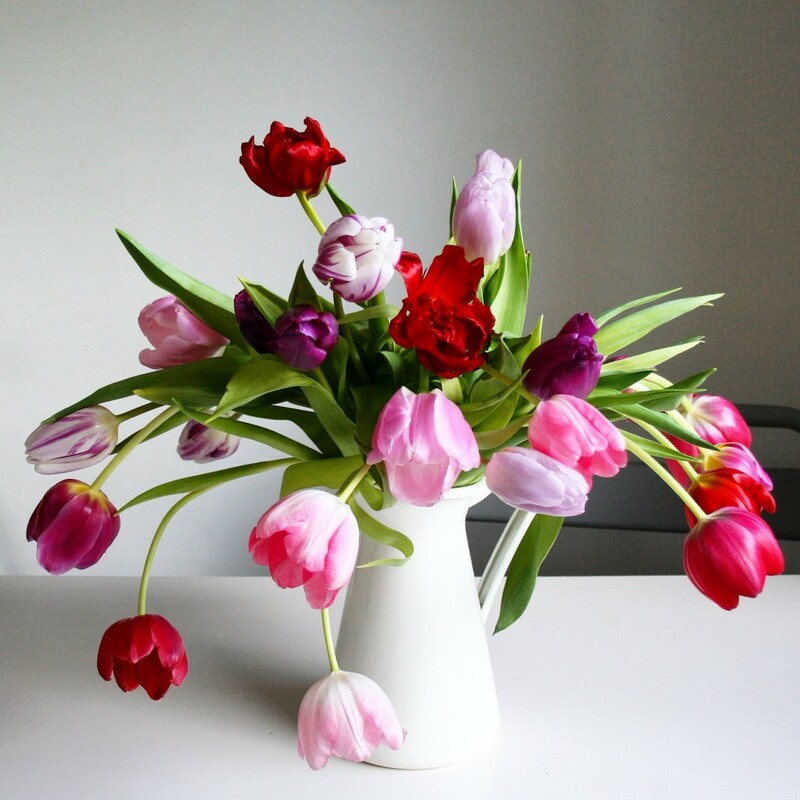 As with roses, tulips change their meaning with the colour. 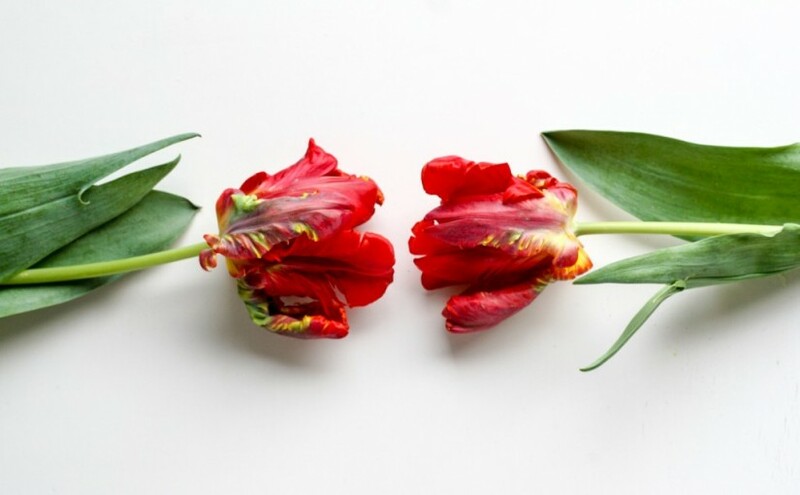 Red tulips are a declaration of love or perfect love while yellow tulips represent a hopeless love. 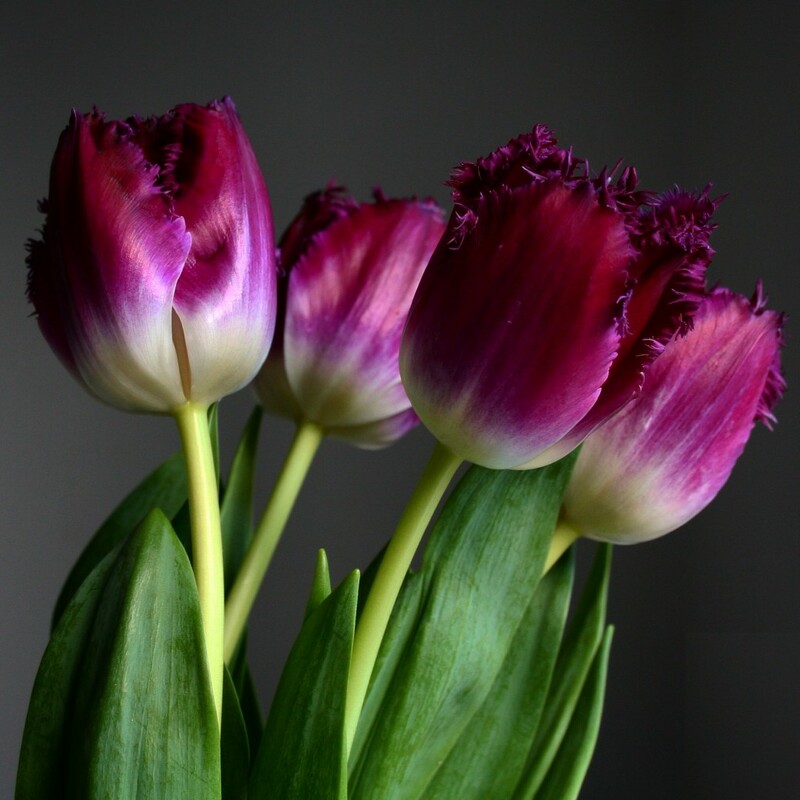 Pink tulips mean friendship, white tulips forgiveness and purple tulips represent royalty. So tell me, are you planning to give someone Valentine’s flowers, or are you hoping to receive flowers? I would love to hear! Word altijd weer blij van je mooie fotos en verhalen! Uitzonderlijk fraaie foto’s, hoe krijg je dat steeds voor elkaar, groet Gerhard. Prachtige foto’s weer, vooral die van de witte ranonkel en die van de paarse tulpen (die glans er op!). Ze doen me echt denken aan bloemenstillevens uit de Gouden Eeuw, je foto’s kunnen zo in het Mauritshuis. Als je foto’s daar eenmaal hangen moeten ze het museum wel hernoemen naar Mouritshuis. Thanks, Elisha! I have followed your friend on IG, it will be interesting to see how she grows her roses. 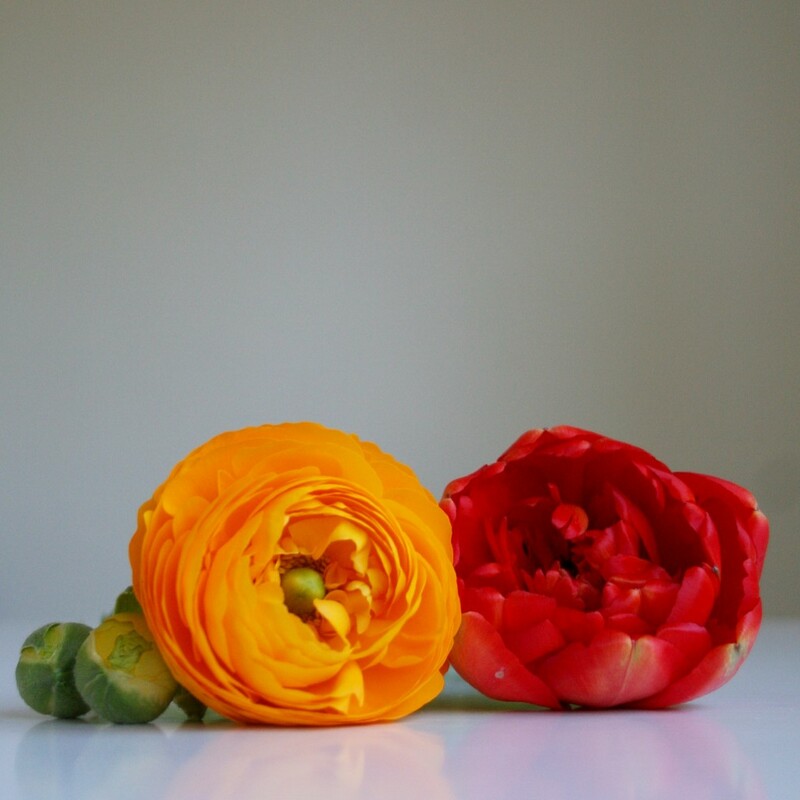 You are lucky you have Ranunculus growing in your garden! I bought some last year, they just died. I don’t think I have ever seen them in a garden, so I think I will just keep on buying them as cut flowers at the market.